Spring arrives in Durham with the sudden flourish of blooming daffodils, blueberry bushes and fruit trees followed by waves of airborne pine pollen that all but blot out the sun at their peak. The green grass returns and the willow oak trees fill with buds which open into thin leaves that shimmer and chatter in the winds announcing the return of rain that will wash away the pollen and start the growing season for gardens all over town. 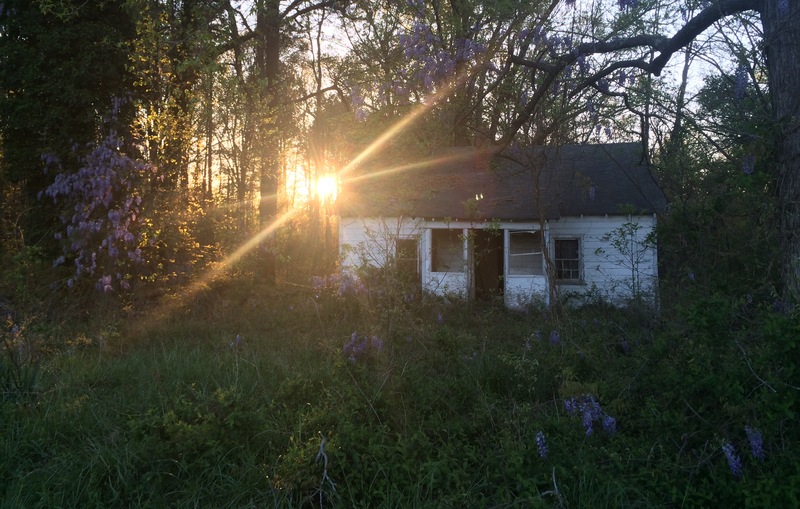 Even the wild wisteria pauses in its reclamation of old abandoned houses to adorn their ruins with curtains of purple flowers. 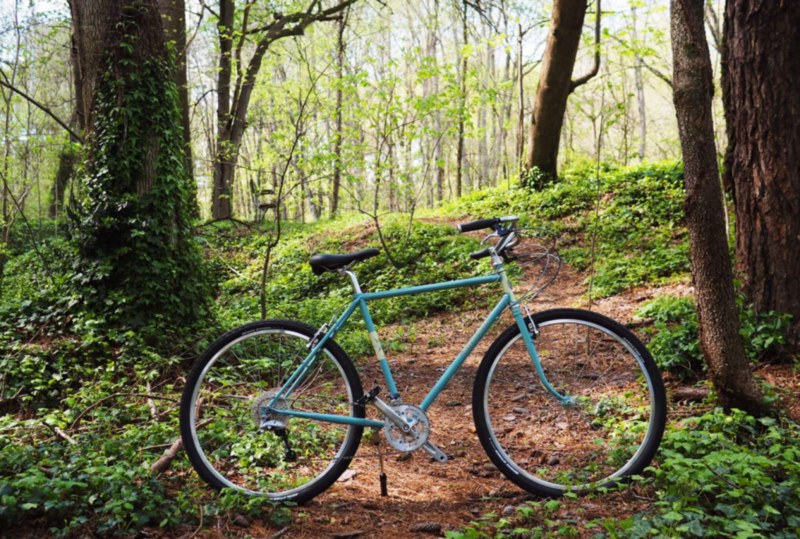 This is the perfect time for walks through the woods and bike rides at sunset, stopping to chat with friends in the neighborhood who are taking their dogs for an extra long walk on a beautiful evening. 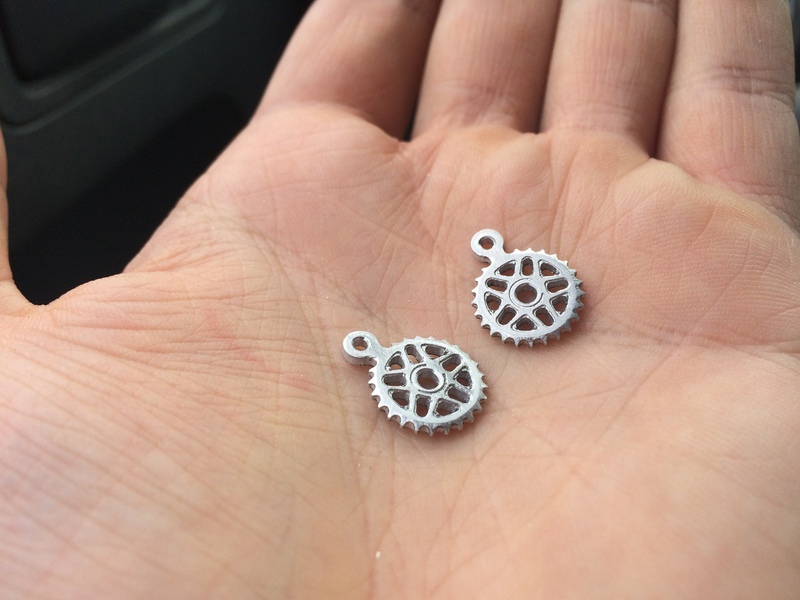 Inspired by all that unique restless excitement of spring, I had an idea for a pair of earrings shaped like bike sprockets. 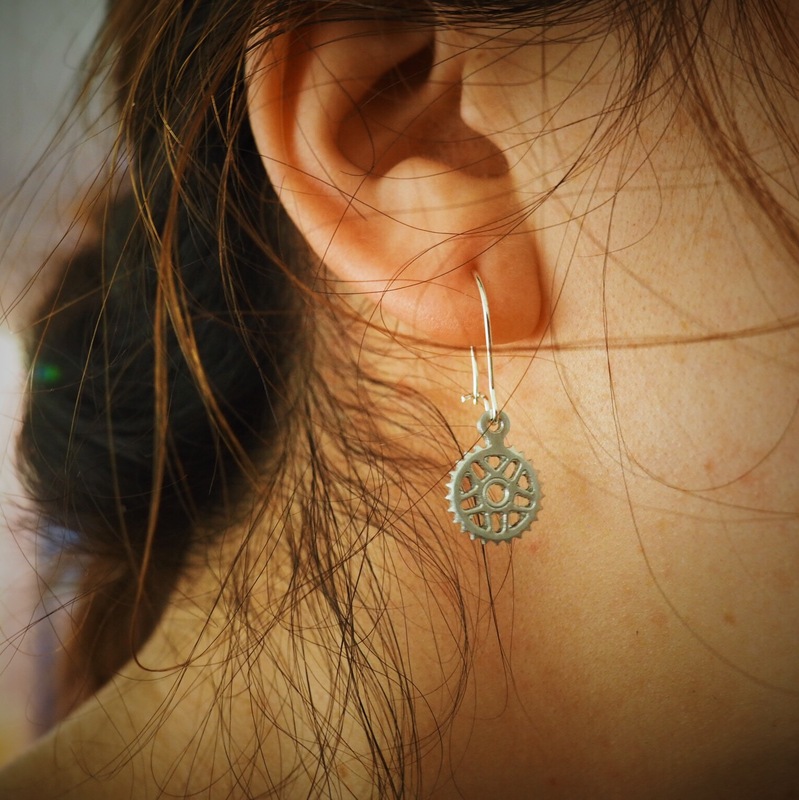 I poked around on Etsy for a while and couldn’t find exactly what I wanted–and besides…shouldn’t I be able to figure out how to make these myself?? So I poked around on google looking for a picture of a sprocket that matched those on my girlfriend’s Joe Appaloosa. I imported the photo into vCarve and traced it using their bitmap trace function. I determined that I’d need a bit no larger that 3/64″ in order to get the detail that I wanted so I picked up one of those along with a 1/8″ collet from Precise Bits. I wanted to put a bevel on the teeth like you might see on an actual sprocket, but I didn’t have a bit with quite the right angle. Rather than fussing around with a 3D feature carved with the handibot I decided to just take a little file and bevel them by hand. All things considered the process took a little over an hour from idea to final part–just in time to bring home as a gift before our evening bike ride around Oval Park! Glad the project got you excited! To make these earrings I bought some 1/16″ 6061 Aluminum–you can find this at places like http://www.mcmaster.com . To set up the engraving I used vCarve 8.0 software (comes included with the handibot). I found a picture of the sprocket I liked online and used the bitmap trace function in the program to create an outline of the sprocket. I drew a little loop on the top and told the tool to cut out around the profile of the shape. Using vCarve is similar to using a regular paint program–except once you’re done drawing the shapes you select a bit size and cut depth to create your part in 3D. Please give us a call at 919-213-8348 if there is any more that we can do to answer questions for you!